The longer I sit on a post, the longer it never gets published. 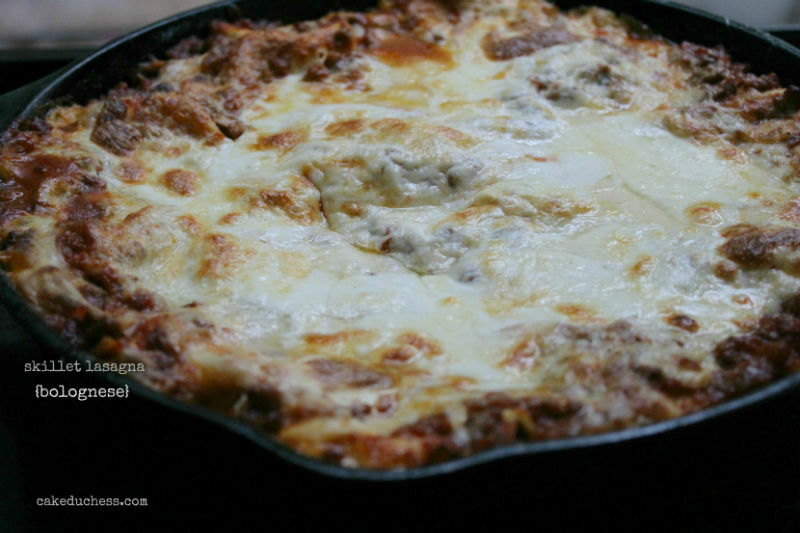 What did it take to publish this sensational skillet lasagna Bolognese. Apparently, a lot!! I cook every night for my kids. Can I tell you how often I make a pasta dish? Very often. 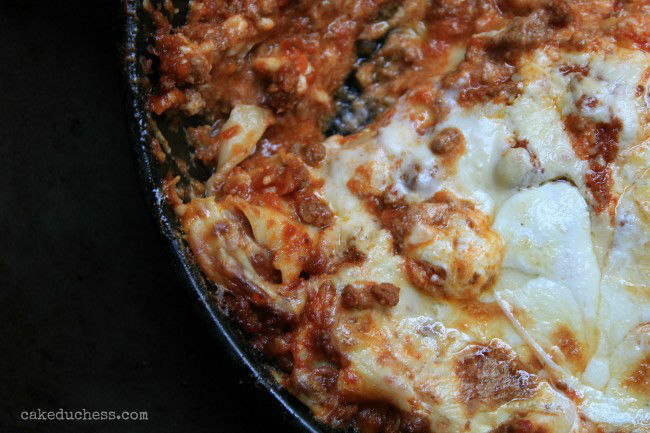 There aren’t too many pasta dishes that create excitement as this skillet lasagna Bolognese!! It does take a little work. I won’t pretend that it doesn’t and that it’s something you just whip up. Well, actually, it could be!! You could make this lasagna in steps. Like, prepare the meat sauce the day before. Prepare the besciamella (cream sauce)the night before). I have made and had lasagna many times with ricotta cheese. But there is nothing that compares with the dreamy texture of a homemade besciamella sauce. What is besciamella exactly? Besciamella (or, bechamel, as it’s known is France), is a white sauce. You make it by starting a roux (a paste) of flour and butter and by adding in milk to this paste. It is pretty commonly used in French and in Italian recipes. Once you learn how to master this luscious and delightful white sauce, you may think twice about adding ricotta cheese to your lasagna dishes. If you’re simply not into meat or meat sauces, you could make another fantastic lasagna dish that is vegetarian. This butternut squash lasagna is quite popular here and especially during the holidays. 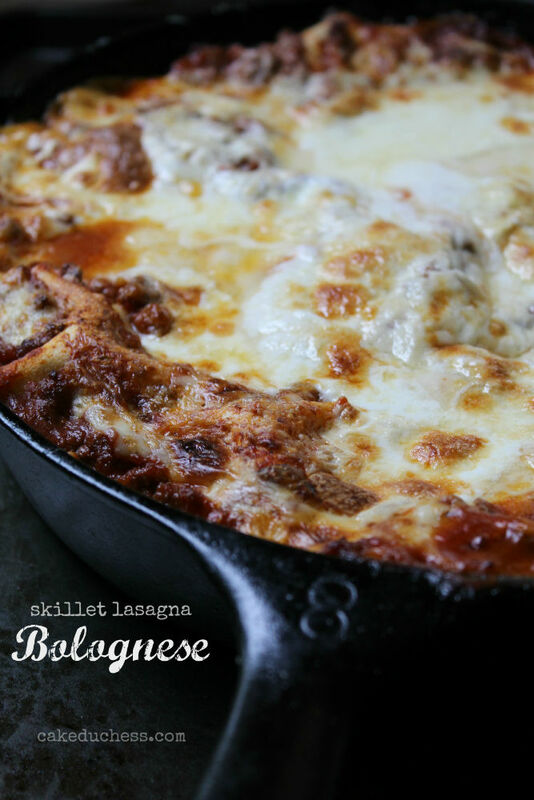 I have seen many different versions of skillet lasagnas. Some use the noodles that have to be cooked and the noodles end up cooking in the steam. I do like to make my own noodles, when time allows. If you are looking for something delicious and fantastic to enjoy on a cold and dreary winter’s night, this might be what will cheer everyone up and make them say, “Mom, you are the BEST!!”. That’s what my kids say when I make this dish!! 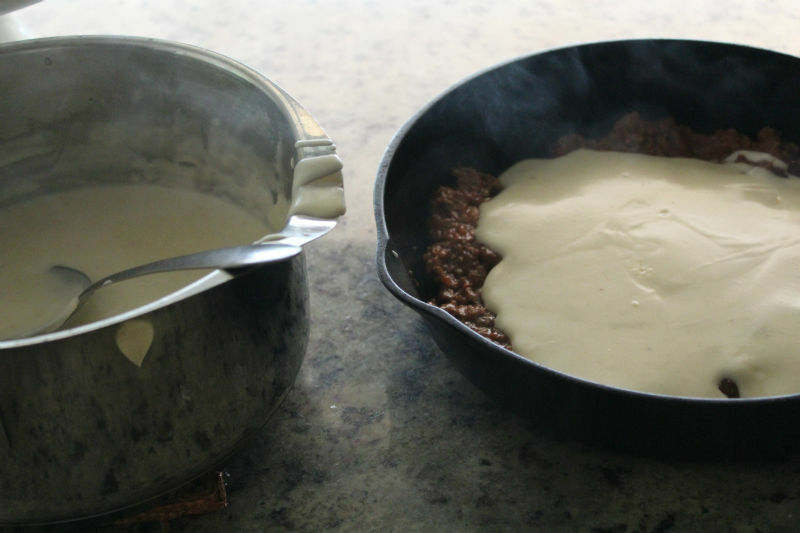 If you are like me, you may be wondering how to take care of your cast iron skillet. Thanks to my dear mom, I have that covered!! She actually will inspect my skillet once in a while and will admonish me for not taking better care of it. She harumphs and she quietly belly aches as she lovingly makes my sad skillet come back to life. Here are some great care tips for your skillet and also just some wonderful ideas on how to cook and bake in your cast iron skillet. Here is a recipe for Grandmother’s Buttermilk Cornbread I shared quite some time ago, but it still SO GOOD!! Here is Heather’s cornbread recipe *(sweet brown butter cornbread, to be precise!) that she makes in her cast iron skillet…gosh, I would love a piece right now, it looks amazing! And if you are taking out your cast iron skillet and want to bake something sweet, instead of savory, you should consider this (it’s vegan!!) upside-down cake…just, wow!! Or if you’re craving chocolate, this one may be for you (it has Nutella in it!). Hope you’re having a super week and staying warm. Thanks for your comments and I appreciate your support!! In medium size sauce pan or a Dutch oven heat the oil on medium heat. Add the onion and cook for 2 minutes. Add the celery, carrot, and garlic and cook for 5 minutes more. If you are adding the pancetta, now is the time to add it and cook for 5 minutes, then add the beef and saute, stirring frequently. I simmer my ragu (Bolognese sauce/meat sauce) for about 2 hours. You could make this a day ahead. 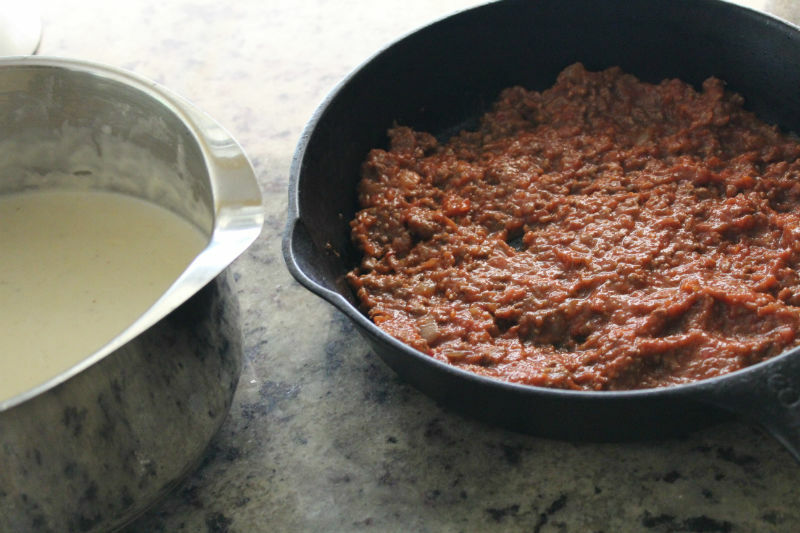 Spread 1/2 cup of the meat sauce in a large cast iron skillet (or nonstick skillet). Cover with 2 lasagna noodles. Spread half of the besciamella (white sauce) on top of the noodles, then sprinkle with one-third of the mozzarella. Add another layer of noodles, the remaining besciamella (white sauce), 1 cup meat sauce (Bolognese) and half of the remaining mozzarella. Top with the remaining 2 noodles, then the remaining meat sauce and mozzarella. Sprinkle with the remaining 1/4 cup of Parmigiano Reggiano cheese. Cover the skillet with a piece of aluminum foil paper. Bake covered for 30 minutes. Bake uncovered for the remaining 15-20 minutes. Cheese should be bubbling on top.